Maria Menounos from Access Hollywood interviewed Bristol Palin and Mark Ballas after their outstanding performance on Week Two of Dancing With the Stars (h/tp Dance Bristol Dance). During the interview, which took place during Week 3 rehearsals, Bristol and Mark discussed what it was like having their mothers in the audience. It was mother mania at last week’s “Dancing with the Stars” for Bristol Palin and her professional partner, two-time mirror ball champ Mark Ballas. During this week’s rehearsals, the charming couple opened up to Access Hollywood’s Maria Menounos about everything “Dancing” – including what it was like to have both of their moms on hand for their live performance. VIEW THE PHOTOS: Dancing With The Stars Season 11 Highlights! 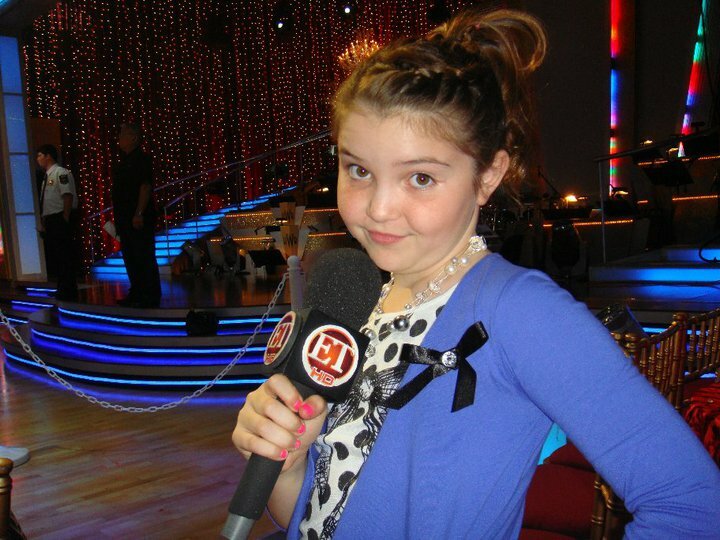 Brandi Beagle Jones has a great group of DWTS photos on her Facebook page (h/tp Dance Bristol Dance), including this really cute one of Piper. Remember to watch Dancing with the Stars, Week 3 tomorrow night on ABC at 8 PM EST and vote for Bristol and Mark! You can vote by phone by calling 1-800-868-3407 or by texting 3407. Voting online can be done at the Dancing With the Starts Voting Page. Voting by phone is open from the start of the show until 30 minutes after. Online voting is open from 8 PM EST on Monday night until 11 AM EST Tuesday morning. You can use your Facebook, MySpace, Twitter, and personal e-mail accounts to vote. There is more information about voting at VOTING — HOW IT WORKS. As you know, our votes are factored in with the judge’s scores. We know Bristol and Mark’s performance will be stellar, so let’s do our part as well. Let’s get out the vote for Bristol and Mark and help them win Round 3 of Dancing with the Stars! Dance Bristol Dance has posted a link to the latest entry in Mark Ballas’ “DWTS journal” at USA TODAY. There Mark gives us a hint of what we can expect on tomorrow night’s DWTS. This week is the fastest Bristol’s ever picked up the choreography. She’s growing every week and really starting to move like a dancer, not someone just learning to dance. We rehearsed Wednesday for six hours. I was pleasantly surprised by how well she was doing by the end of the session. She was practically ready for Monday already! Fox Trot is similar to the Quick Step, but much slower and smoother. I’m sure she’ll once again nail it on Monday’s show like she has the previous two weeks. And if she keeps doing so well we won’t be under the radar for long! TUSCALOOSA, Ala. — Alabama Republican governor candidate Robert Bentley has turned down an offered endorsement from former Massachusetts Gov. Mitt Romney, expected to be a candidate for the Republican nomination for president in 2012. The Birmingham News reported that Bentley turned down the endorsement. A spokeswoman for Bentley, Rebekah Mason, said Friday that Bentley wanted to concentrate on the race for governor and did not want to give the impression that he was endorsing anyone in the 2012 presidential race. Of course, I don’t blame Robert Bentley one bit. Think about it, much like Barack Obama, Nancy Pelosi, and Harry Reid represent everything that is wrong with the democrat party, Mitt Romney represents everything that is wrong with the Republican Party. Romney is a Big Government Statist, a squishy, finger in the wind, flip flopper, who will say anything and do anything to get elected, and then let you down at every opportunity. Then there is RomneyCare, which is rapidly becoming a disaster of biblical proportions for Massachusetts, and served as the blueprint for ObamaCare. 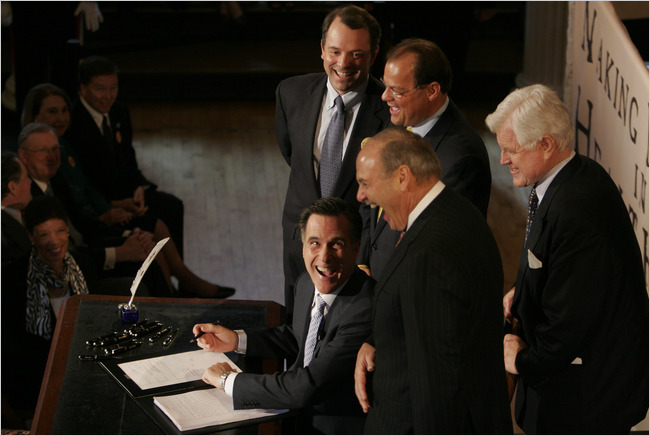 That’s Mitt in the photo above, laughing it up with none other than Teddy Kennedy, as he signed this abomination into law. You know, I’m constantly amused by the left wing loons, the lamestream media, and the GOP elite who try to convince us that Sarah Palin is toxic and we should all run away from her. Fact is Sarah has endorsed winning candidates from coast to coast, from the reddest of red states to the bluest of blue. She draws huge crowds wherever she goes, even places like Boston and Minneapolis, not exactly the bastions of Conservatism. Sarah has had candidates publicly lobby for her endorsement, only to be turned down, but she has never offered her endorsement to someone only to have it refused. No just the opposite, in fact. During the primaries, when the fields were crowded, candidates passed over by Sarah for someone else were often openly and loudly upset they weren’t the chosen one. I guess my point is Mitt Romney bills himself as a Conservative, and yet, he can’t even get any love in a deep red state. On the other hand, Sarah Palin can walk right into the Belly of the Beast, the bluest of blue states, and be welcomed. Sarah’s crowed October event calender, seen below, shows her spending a lot of time in California, including Nancy Pelosi’s hometown, San Francisco..
Maybe Mitt should take a hint. We don’t need any more squishy Republican Ruling Class elites, who blow with the wind. We’re overstocked with them already. We need real leaders, leaders who are not afraid to get out there and fight. Leaders who aren’t afraid to actually stand for something, and stand by their convictions. Squishes, Statists, and Ruling Class elites need not apply. Did John Thune Just Confirm The Obvious About 2012 And Sarah Palin? I think that if she were to get into the race, it would clearly change the equation for a lot of people. Well, yeah. I bet it would! Sen. John Thune said Thursday that Sarah Palin’s decision whether or not to run for president will “change the equation” for him and all other potential Republican contenders. “She is someone who has a tremendous following out there, particularly in some of the early states,” the South Dakota Republican said in an interview with CNN’s “Situation Room” that will air later Thursday. Thune said that he will make his decision about running sometime early next year, but he conceded that the possibility of a Palin run will be weighing heavily on his choice. “I think that if she were to get into the race, it would clearly change the equation for a lot of people,” he said. It’s becoming quite clear that folks are starting to realize just what a powerhouse Sarah Palin truly is. I would imagine her incredible record of winning endorsements has opened a lot of eyes, and made the establishment sit up and take notice. And if that hasn’t, her successful mission to rid the Republican Party of dead wood, and squishy establishment elites, RINOs, most certainly has. Sarah’s game changing involvement in Alaska and Delaware has shaken the GOP elites, the Country Clubbers, to their very core. With that said, we hope there is a robust field of Republican candidates in 2012. As Sarah herself says, competition is great. Strong competition brings out the best efforts from everyone. It makes everyone, especially the winner, even stronger. It’s more satisfying too. As a racer, those wins always tasted sweeter when I faced off against the best. A good competitive primary will be a nice workout for Sarah as she readies to take on Barack Obama. (If indeed Obama is the nominee) Past that, the last thing anyone wants is a coronation, the perception the win was just handed to her. Thune is a fine man, but more establishment than Conservative. Not exactly Mitt Romney 2.0, but enough of a Statist to cause some concern. One thing about it, 2012 is already shaping up to be an interesting contest. You can read my take on the latest statistical analysis that says Sarah is the odds-on favorite for 2012 here. One final thought: While all of this is interesting, let’s not lose sight of the fact the election is a mere five weeks away, and we all know how time flies. Get out there and knock doors, man phone lines, and do whatever you can to insure a great Conservative victory on November 2nd. We love the guys over at HillBuzz. They are some of the most passionate and creative activists in the Conservative movement. Their commitment to returning America to it’s greatness is inspiring, and their support of Sarah Palin knows no bounds. Their latest effort is simply wonderful. With some creative work by Chrissy the Hyphenated, an old favorite has been updated, with Sarah Palin standing among her peers, Republican Presidents of the United States. Seen along with Sarah are: Abraham Lincoln, Teddy Roosevelt, Dwight D. Eisenhower, Richard Nixon, Gerald Ford, Ronald Reagan, George H.W. Bush, and George W. Bush. Though not the President today, odds are she will be joining these men in that capacity real soon. Click the image above to make larger. The odds-on favorite to win the GOP presidential nod in 2012 is none other than Sarah Palin, according to a statistical formula developed by Villanova University Prof. Lara Brown. The professor’s figuring is bad news for presumed hopefuls like Rep. Mike Pence, Sen. Jim DeMint, ex-Gov. Mitt Romney, former Speaker Newt Gingrich, Gov. Haley Barbour, and former U.N. Ambassador John Bolton. Many simply joined the game too late, says Brown, author of the new book Jockeying for the American Presidency: The Political Opportunism of Aspirants, which studies every election since the founding. Others, like DeMint, are still brewing but won’t be ready until 2016. As for Newt? “I don’t think the GOP can forgive him,” she says. The book devises an “opportunism variable” based on the candidate’s résumé to explain who wins the presidency and why. Palin has an advantage because she has been elected both mayor and governor. She also was a major party vice presidential nominee, giving her an enviable breadth of political experience. According to Brown, candidates who take risks and run for a variety of offices do well. It’s even better if they lose a presidential race or two. “It takes about a run and a half to get there,” Brown says. Pols “may think they can get it done in six months or a year, but [winning] will actually take them running, losing, and planting seeds,” she says. We tend to agree with the assessment that Sarah Palin is the favored candidate, with possibly some different reasoning on how to get there. As Brown concludes, Sarah Palin has a huge advantage due to her length of time in actual public service. When you look at the rest of the field, no one has the bottom up working knowledge of how government actually works, as well as a good solid opinion of how it should work. Sarah, unlike most of the high profile names, has a story that simply can’t be equaled by the rest. As a young mother, Sarah decided to get involved with her kid’s education, hoping to ensure a bright future for them. Sarah’s involvement with the PTA would lead to her recruitment to run for an open seat on the Wasilla, Alaska city council. Successful and well liked, when the sitting Mayor was term limited out, she was again looked to as a leader. Again she was asked to step up. As Mayor of Wasilla, Sarah proved her worth and helped grow and modernize the city. She was also voted in as president of the Alaska Council of Mayors. When Sarah was term limited out, it was suggested that she run for Lt Governor. Though her run was a losing effort, Sarah caught the eye of many of Alaska’s top leaders, including then Governor, Frank Murkowski. Though many expected Murkowski to appoint Sarah to the his remaining term in the U.S. Senate (he left the Senate to become Governor) Papa Frank appointed his daughter Lisa, instead. Sarah didn’t walk away empty handed though, as Murkowski would appoint her Chairman of the Alaska Oil and Gas Conservation Commission, where she would serve as the state’s chief oil, gas, and environmental regulator. One of the most powerful jobs in the state, with her reporting to the Governor. The rest of the story is well known. Sarah uncovered massive corruption, took this to the Governor, who chose protecting his buddies over what was right, so Sarah resigned. At the time Alaska’s AG was warning her that if she blew the whistle on Murkowski’s “Corrupt Bastards Club” (a name they called themselves) she would face criminal charges of some sort. What did Sarah do? She blew the whistle, of course! This would lead to a huge shake up within the Alaska Republican Party, touching every one from the party chair on down. It also led up to a highly successful bid for the Governor’s office, by Sarah. As Governor, Sarah would go down in history as one of the state’s most successful. This included massive ethics reform, cleaning up the budget, and straightening out Big Oil, which prompted Petroleum News’ publisher and executive editor Kay Cashman along with editor-in-chief Kristen Nelson to write the compelling book: Sarah Takes On Big Oil, which if you haven’t read, you simply must, in order to understand exactly how effective of a CEO Sarah Palin is. The book is available from Amazon here. As Governor, Sarah Palin was also the Chairman of the Interstate Oil and Gas Compact Commission, a multi-state agency that works to explore for energy in environmentally responsible ways. Sarah was also the Natural Resources Committee Chair in the National Governors Association. This should help folks understand Sarah’s passion about our nation’s abundant energy resources and their development. She knows first hand that both our financial security, as well as our national security are tied to developing our own oil and gas, as well as nuclear and other sources of energy that our nation is rich in. Sarah was also an active Commander-in-Chief of both the Alaska National Guard, and the Alaska Defense Force. Her efforts on the behalf of both groups are well know. You know, I always laugh when “concerned” folks say they like Sarah but think she needs to run for the Senate before running for President, so she can “learn how government works.” Frankly this notion is hilarious to me. Never mind the fact that the Senate is little more than a glorified debate society, something Conservatives are trying to remedy, the fact is, Sarah Palin has probably forgot more about how government works, at every level, than the rest will ever know. Sarah literally started at the very bottom, and has held every Chief Executive position a person can hold in American politics, except the presidency, and if American Conservatives get their way, she’ll be adding that to her incredible resume starting in January of 2013. You know what makes this even more remarkable, and very special? Sarah Palin did all of this on her own. There was no rich, politically connected father or husband whose coattails she could ride along on. Just good old fashioned hard work. The sort of hard work that built this great nation in the first place. Of course, behind every good woman is a good man, and Sarah has the very best in Todd. Neither a woman nor a man could reach such heights of success as Sarah, without the total support of their family. You know, you look back at Sarah Palin’s life, her amazing accomplishments, her unwavering optimism, and unbridled love and enthusiasm for her county, and you start to think. I’ve said this before, but if Sarah Palin was a progressive, a Marxist, Hollywood would be fighting over the rights to commit her life’s story to film. What’s so interesting about this, is Sarah Palin is a real feminist, and a real example for women everywhere. Sarah has proven that women can be just as effective as men at anything they wish to do. She is everything those progressive women claim they are for, and then some. Oh well, to heck with Hollywood, I guess our Sarah will just have to settle for the White House. You know, I’m OK with that. I bet she is too. First let’s look at Congressman Mike Pence and Senator Jim DeMint. Both are solid Conservatives. Both are real leaders. However (there’s always a however) there are a couple of issues. One is kinda selfish. Though the GOP is going to pick up an incredible amount of seats in 2010, there will still be more house cleaning needed in 2012. Past that, as leaders, both of these men will be needed to serve their nation in their current jobs, with a move up the leadership rung. No one can say how many seats Republicans will take away from Marxist control come November. Conservative estimates are in the 40s all the way to 100, or more, by the really optimistic. Doesn’t matter though, whatever the number it will be historic, and the way the House works, all one needs is a simple majority. Good leadership is essential though, and Pence will be part of that. The Senate is more of a problem. The rules are as such that it takes skillful maneuvering and so-called super majorities to really cook. For the Republican Party, the Senate has always been the weak link. The House has always been full of fiery characters who will fight for Conservative principles. The Senate is where the elite, the Country Club set, the RINOs, and worse, end up. Thankfully, this election has seen most of that sort eliminated in the primaries, with good solid Common Sense Conservatives waiting in the wings to take their places. That’s all well and good, but the Senate Republican leadership is full of squishes. Really weak. Not horrible, but certainly not what these times call for. This is where Jim DeMint comes in. With any luck he will be elected the new Senate Majority Leader. Again, these are selfish things, because we know, for the good of the Republic, these men are needed where they are at. Now for the practical. Neither Pence nor DeMint have any executive level government experience. There’s a reason why America generally elects Governors as President. Barack Obama is a shining example of why. Congresscritters, with few exceptions have never learned and developed the skill set require to be a CEO. It’s totally different than the skills needed in the Legislative Branch of government. Next up is Mitt Romney. Three words: Ain’t. Gonna. Happen. There is a carefully crafted myth and aura that surrounds Mitt Romney. The fairy tale that Romney is some sort of superman business guru and effective leader has been shoved on the public for some time now. While some believed this for a while, most have come out from under the either. Not even taking into consideration the catastrophe that is RomneyCare, which has destroyed health care in Massachusetts, and is bankrupting the state. Oh, and lets not forget that RomneyCare is the absolute blueprint that was used to create ObamaCare. No, let’s not even consider all of that, for now. A quick look at Romney’s record as Governor show it’s filled with failure after failure. He was one of the worst. He ran on creating jobs, and yet, after his first year in office, the Bay State was number 50 out of 50 states in job growth, and this was during a robust economy. Never got above 47. Romney may have the skill set to make money and even manage money, but he has proven he has zero governing skills, no Chief Executive skills, and well, that’s the job he will be applying for. Past that, Romney just isn’t a leader. In fact, he’s become a joke among many Conservatives for his propensity to wait until the day after a primary contest, and then endorse the winner. There are exceptions, of course. Romney endorsed Nikki Haley in South Carolina before Sarah Palin did, but other than helping with money, it was of little value, and Haley was dead last in a crowded field of “good old boys.” Sarah Palin came in and with-in days Haley was the front runner and now Nikki Haley is well on her way to being the Next Governor for South Carolina. Sarah Palin has that kind of juice. Romney, not so much. The other really major problem with Mitt Romney are the flips and flops. When he ran for the Senate against Teddy Kennedy, he ran as a full blown liberal, to the left of Kennedy. When he ran for President in 2008, he remade himself into Ronald Reagan reincarnate. Even went to CPAC and just wowed the crowd as he channeled The Gipper. There is not a principled bone in this guy’s body. He is the ultimate political opportunist. He is who ever the crowd needs him to be on that day, at that specific moment. The ultimate finger in the wind politician. 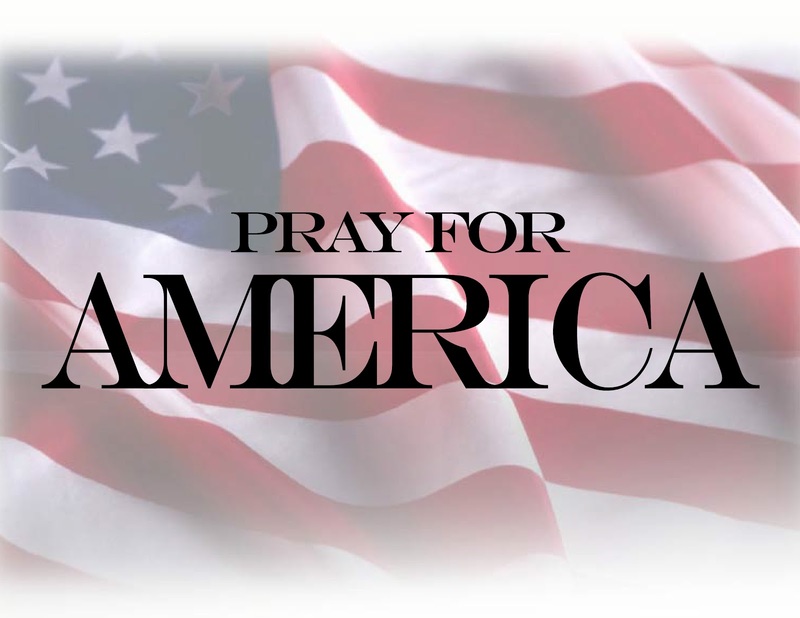 There may have been a time where one could get away with that and be elected, but with the very existence of the Republic as we know it in the balance, Romney is at the wrong place at the wrong time. History has passed him by. Speaking of being elected: Let’s face it, Romney came in third, in one of the poorest fields of candidates the Republican Party has put together in my lifetime. If Romney couldn’t beat John McCain, let alone Mike Huckabee, he just doesn’t have it. I have one more pick on Romney, then I’ll move on. Romney’s problem is he wants it too much. He has a raw, naked lust for the presidency. Instead of leading, Romney has been mostly hidden away, hoping not to have to go on record for anything, lest it come back and bite him in the arse in 2012. In his mind, it’s better to stay quiet, rather than help save our nation. Romney could crawl out of his hole and be useful, but all he seems to care about 2012. 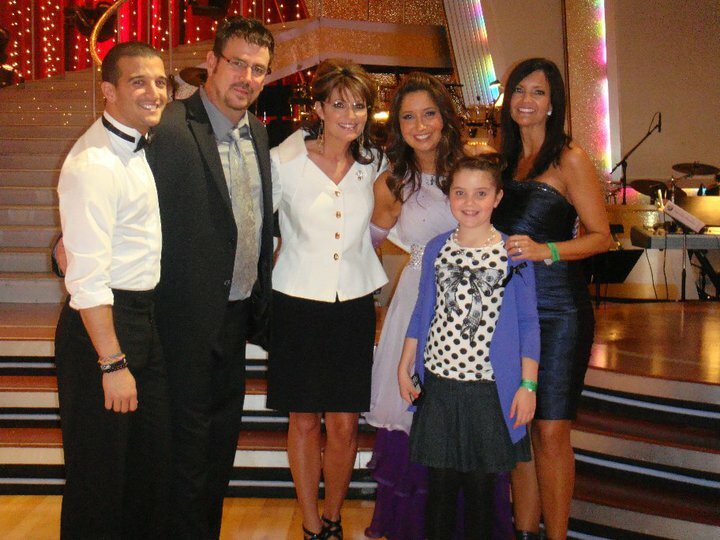 This is where Sarah Palin really has shined. Remember, this is a woman who famously said: “Politically, if I die I die, I’m not going to sit down, I’m not going to shut up.” Sarah honestly doesn’t care about titles, and has proven beyond the shadow of any doubt that one doesn’t need a title to lead an entire nation. The effect she is having right now will shape this nation for decades to come. Much like the efforts to draft Sarah for the Vice President’s role, Sarah will find herself compelled by the people to run. She’s made her case already to the people, now the people will make their case to her. Newt Gingrich used to be a hero to many Conservatives. What ever juice he had is gone. Newt has morphed into one of the go along, get along squishes who, frankly, has shown his judgment is highly questionable. The list is long, and I won’t even get into the personal stuff which makes a serious run almost impossible. Let’s just look at recent bone headed moves by Newt. The most egregious act was appearing in a television ad on behalf of Al Gore and his global warming scam. In the ad Newt appears on a park bench with Nancy Pelosi touting the hoax. Newt’s excuse was “you must sit at the table to be part of the process.” No you don’t. Not when the process is to promote a hoax, which will be used to craft legislation that will destroy the nation’s economy forever, while enriching a handful of criminals! Nope, what you do is stand up, use your stature, and prove that the hoax is, well, a hoax! Do I have to even mention DeDe Scozzafava, or Newt’s love of giving joint speeches with race pimp Al Sharpton? Look, Newt lost me with the Al Gore thing. Anyone ignorant enough to help promote that nonsense is simply too ignorant to be taken very seriously at all, and most certainly too ignorant to be President. With that said, the last straw was when the racist NAACP attacked the Tea Party Patriots. The NAACP, trying to make itself relevant again, decided to call the Tea Party, which has a significant minority participation (almost 1/3 of all Blacks support the movement) racist. What was Newt’s answer? It wasn’t to get in the NAACP’s face, or stand with the Tea Party. No, Newt’s idea was a sort of “beer summit” of his very own. Stupid. Much like canoodling on the bench with Nancy Pelosi lent credibility to Al Gore’s hoax, talking with the NAACP would have legitimized their claims of racism. The only thing anyone wanted to hear from the nimrods at the NAACP was an apology! Newt is a thinker. Sometimes he comes up with some brilliant ideas. But doggone it, for every good one, there are many train wrecks waiting to happen. So put me down as a no on Newt. He’s doing exactly what he should be doing, writing books and spreading the message of Conservatism. As for John Bolton. His mustache alone is more awesome and powerful than most men. With that said, he will make an outstanding Secretary of State in the Palin administration. This is the job Bolton was born to do. Kind of a long winded addendum elaborating on a couple of paragraphs of scholarly analysis, I guess, but there’s a lot of material packed into those two paragraphs to expand on. The bottom line is this: While no one can be totally prepared for the job, there is simply no one else in the country more prepared to be President of the United States than Sarah Palin. She is the one leader who can step in immediately and hit the ground running, as is her style. On the political side, no one draws a crowd like she does, and absolutely no one does retail politics as well. You can bet that in both the primaries, as well as the general election, Sarah will work hard for every single vote. Fight for them, just as she did in every election in Alaska. 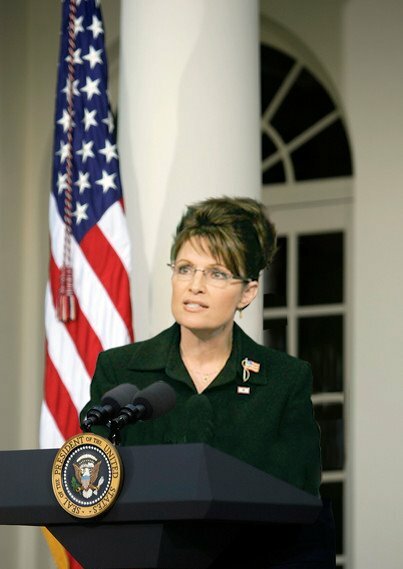 Although nothing is a given, if Sarah Palin runs, odds are she is the next President of the United States. Despite what Mitt Romney said a few days ago, with the right person, Barack Obama will lose and lose big in 2012. He is this generation’s Jimmy Carter. That’s kinda poetic, really, because Sarah Palin is this generation’s Ronald Reagan.